Most of us have been told ‘take your vitamins’ on more than one occasion, and we listen because…well, because vitamins are good for you. Right? Plus, not everyone likes to eat their broccoli. 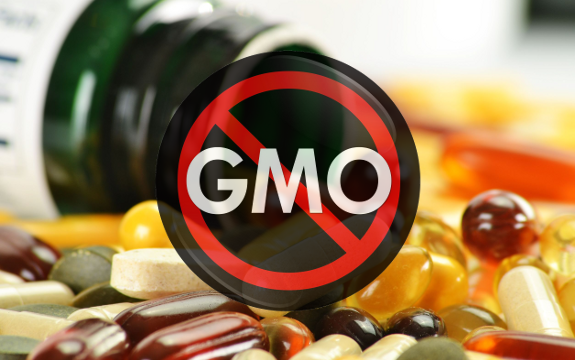 The problem is that the vitamin industry has been tainted with Big Ag and Big Pharma, too. Consider the fact that Bayer is one of the largest makers of vitamins for children. This is a huge drug and chemical giant responsible for helping to develop many GMOs, all while creating health-boosting vitamins? Questionable. Can we really trust these companies with our health? “All of our C is derived from standard corn not certified to be non-GMO… Many products [in the industry at large] contain soy or corn derivatives which are generally GMO’d. We are motivated towards non-GMO-sourced products. The Hungarians burned thousands of acres of GM corn in a no-nonsense policy to oust Monsanto seed crops from their country, yet we are putting the stuff in our ‘health’ food. This is another ‘filler’ in many vitamins used in the industry and another one of Big Ag’s top three GMO crops. Soybeans, along with rice and sugar beets, were one of the first crops genetically altered to be more resistant to pests. It is prevalent in our local food sources, but also in countries over seas. Soy is arguably the most common GM crop, with up to 75-85% of the soy grown in this country being GMO, as estimated by a McGill University study. The study also points out that GMO soy acts like an estrogen in the body and can cause our hormonal systems to malfunction. In the worst cases, it causes ovarian cancer and uterus swelling. Also used in sugar free cough drops, genetically modified sugar beets are in numerous brands of vitamins. Used to sweeten your vitamins, you can bet that many seemingly innocent brands of vitamins, including Flintstones for children, made by Bayer, are comprised of genetically altered sugar. “Flintstones Complete Gummies are comprised of “glucose syrup, sucrose, gelatin, water, choline bitartrate; less than 2% of: artificial flavors, ascorbic acid, bees wax, carnauba wax, citric acid, d-biotin, d-calcium pantothenate, fd&c blue #1, fd&c red #40, fd&c yellow #6, folic acid, potassium iodide, pyridoxine hydrochloride, vegetable oil (coconut or palm), vitamin A acetate, vitamin B12, vitamin D3 (cholecalciferol), vitamin E acetate, zinc sulfate.” As you can surmise, the vitamins are largely comprised of sugar – either high fructose corn syrup or sucrose likely derived from GM sugar beets. Other brands like Gummy Kings and Disney have very similar ingredient lists. The good news is that our ancestors didn’t have Flintstones vitamins, but they did eat non-GMO foods, like oranges to prevent scurvy and other diseases that are caused by a deficiency in Vitamin C. Real, organic foods have all the nutrients we need, especially when we eat a rainbow of colors and include a variety of non-GMO fruits and vegetables in our diets. All of the non belivers in God, lack invisable support! Non-GMO soy produces an estrogen response in the body of female animals and people. It is not GMO soy! This has been long known in wildlife and was cited in Our Stolen Future: Are We Threatening Our Fertility, Intelligence, and Survival?–A scientific mystery story authored by Theo Colborn, and John Peterson Myers, both having Ph.Ds. in zoology, and Diane Duminowsky, formerly with the Boston Globe who made the science more understandable. Their hardback book was published in 1996 by Dutton Press. I found reading this book –fascinating. And purchased it for our town library. Many countries especially in Europe have passed legislation, which was based on the Precautionary Principle as discussed here in this book. European regulations have become more protective of public and environmental health, whereas in the USA, our regulations are no longer. They began disappearing under President Bush and VP Cheney and the Greedy Ole Party. Lord Helsinger (Troll = ad hominem attack + logical fallacy) It seems you know nothing about basic chemistry. So can someone tell me the difference between GMO ascorbate and none GMO? Anth (Troll), GMO vitamin C is MODIFIED. You do know what MODIFIED means right?? It can not be the same as real Vitamin C. Your comment is irrelevant and has NO validity in this matter. Can you please tell me the difference between GMO vitamin C and non GMO? To me the molecular formula is identical. It seems your point about GMO in vitamin C is irrelevant . I’ve been buying Nature’s Way ‘Alive’! From whole foods, Women’s Energy of 50 once daily MultiVitamin MultiMinerals. It says no soy, no corn.